Cyclists in the City: Plans for cyclesafe junctions 'create conflict with motorists and conflict with pedestrians'. Three weeks to respond to TfL's 'better junctions' consultation but only four weeks till they start building. Plans for cyclesafe junctions 'create conflict with motorists and conflict with pedestrians'. Three weeks to respond to TfL's 'better junctions' consultation but only four weeks till they start building. Something odd is going on at Transport for London. The organisation has recently released plans for a number of schemes as part of its Junction Review. "We are seeing a step-change in both the way that people choose to travel, but also in the way that cyclists are viewed on our streets. 'That is why I firmly believe that we must now start to evolve the means by which we plan and manage our extensive network of roads, and why I have asked TfL to review hundreds of key junctions across the Capital to specifically examine safety and provision for cyclists." My general feeling is that the Junction Review is a good thing. I've seen drafts of other schemes and there are some genuinely bold ambitions. But it's never really been clear whether TfL is really committed to these bold ideas or not. One issue that has bothered me about the Review process is the way that each scheme is presented showing the possible impact on motor traffic in terms of how many more seconds motorists might need to wait at the junction in rush hour. What unsettles me isn't so much the inclusion of that data, but the fact that there is no additional data to put those valuable seconds in context. So, there's no data to show how many fewer people might be run over and maimed (whether on foot or on a bicycle) as a result of the scheme. And there's no data to indicate how many people might start chose not to drive and start cycling instead if they felt it was safe enough. Interestingly, these are exactly the sorts of things that Danish transport planners think about when they design a new junction or road layout. I can only wish these sorts of things were standard issue in UK road planning too. Looking at Lambeth Bridge in particular: Rachel Aldred - Senior Lecturer in Transport at the University of Westminster - has written a fantastic summary of the proposals for the roundabout at the northern end of Lambeth Bridge. Her view (put far too politely in my view) is that: "Cyclists using the road will have less space than at present, due to the carriageway narrowing; cyclists using the pavement facility may a) have trouble leaving the road at a sharp angle b) then come into conflict with pedestrians, and c) experience problems crossing using the zebras". She's completely right. Her view is that the design will actively create 'conflict with motorists and conflict with pedestrians'. So, cyclists lose out to motorists and pedestrians lose out to cyclists. As she says, a high quality Dutch-style solution that does none of these things is entirely feasible here. Yesterday, TfL announced plans for another scheme. This time for the Imax roundabout at Waterloo Bridge where cyclists make up one quarter of all traffic (and that's using 2009 data so that percentage is probably higher now). There are some good points about the scheme - the plan sees the removal of one lane of motor traffic and there is talk about possibly reducing the speed limit here to 20mph. There's some positive stuff on the southern and eastern sides of the roundabout where there are both new and wider cycle lanes. Carriageway narrowing in action. This is Cycle Super Highway 7.
which has been made dangerously narrow. But the plans ignore some of the really fundamental problems with the roundabout. The scheme does nothing about the high-speed and dangerous approach to the roundabout from Waterloo Bridge - the carriageway will simply be made even narrower so cyclists will be treated as human speed bumps that slow down (the fast-moving) buses and taxis behind them. Or how about addressing the acres of pointless pavement space around this roundabout such as the eastern side of the roundabout where the road curves in a way that throws cyclists and large motor vehicles together? Transport for London describes this scheme as as an "interim" proposal. I hope so. I wouldn't want to pedal round here with a 15 year-old and I reckon most people wouldn't think of this as a safe place to cycle. I think my real concern is that the current scheme feels like it's designed for people who already cycle here when it should actually be designed for people who would like to cycle but feel too scared to. There are many, many more of those people and I think the design fails badly on that measure. The London Cycling Campaign criticised TfL's plans for Lambeth Bridge, saying it is designed to expose "brave" cyclists to danger on the carriageway and plonks "nervous" cyclists on the pavement. Arguably, this Waterloo scheme is designed for "brave" cyclists. It shouldn't be like this. As the Dutch road safety institute SWOV puts it, the solution is to create a "structural separation" of cyclists and motor vehicles. This is the sort of thing that Rachel Aldred and the London Cycling Campaign are suggesting. It's the sort of thing that allows everyone to get on a bike and cycle safely. You can find out more about the latest Transport for London 'Better Junctions' schemes on TfL's website and you it's well worth reviewing the London Cycling Campaign's initial responses. I'd also urge people familiar with these roundabouts to respond to the online consultation, in particular TfL's Waterloo roundabout consultation. Transport for London is consulting on the Waterloo scheme up to the middle of November. And then the bulldozers move in a week later. What gives with a 7 day consultation period? Surely this is not a legal period. I have fired something over to Jenny Jones and Val Shawcross about it. TfL have clearly made up their minds, and our objections will have no effect. TfL keep saying they are changing, but it is the same old tired crap. ASL's as default option for safety mechanism. Despite Met Police spending a lot of time and effort teaching cyclists not to go up the left hand side of an HGV, and then sit in front of it. We need to get network assurance guys out of these design meetings! The worst thing at Waterloo is the "improvements" which are already there: all three of the "new" feeder lanes at Waterloo already exist - but hang on a secone - now TfL want to make them all worse: they are interrupting the eastern one to put "keep clear" right across it, they are making the western one share a motor vehicle lane (look closely!) and they are breaking up the southbound exit cycle lane just where it's needed most, at the cyclist-crushing left bend. Secondly, it would be breathtakingly simple to make all those advisory cycle lanes mandatory, stopping motor vehicles from wandering into them as they do just as soon as it gets busy. What can we do to push TfL to do these little things? FoI requests maybe? Respond in Dutch so they have to get experts from the Netherlands involved? Eventually TfL will have to take notice of the rising rate of death on their roads; if this was a railway junction they would have shut it down by now until it was made safe. Let's hope real improvements happen before anyone else dies. My commute takes me through this junction every day; I've had a good look at the proposals and I really don't know how to respond to them. They don't seem to do anything to improve the junction for cyclists, either in terms of safety or terms of making it feel less intimidating. Approaching the roundabout from Waterloo Rd you either have to be fast/assertive enough to hold the lane until you reach the bus lane on the bridge, or use the pointless diversion through the bus stands. Last time I tried that I got a bus driver right up behind me in the ASZ revving his engine and trying to push past. Travelling south off the bridge, the traffic speeds are very high, and being able to safely time your exit from the bridge onto the roundabout can be difficult, especially if there's a bus in the nearside lane restricting your visibility. There's plenty of space at Waterloo, and the volume of cyclists at peak times is huge - I think any junction review should include more than just ASZs which aren't enforced! The keep clear looks pretty dangerous. Vehicles coming out will assume they have a reserved gap in heavy traffic and charge forward, not thinking or seeing cyclists coming around in their own lane. I think I can se why it was added but they've not really thought of the consequences to non motor vehicles as usual. The consultation process is obviously a sham. I wonder whether we cyclists should start playing the system, rather than forever trying to appeal to simple good sense. Much was spoken of corporate manslaughter charges re. Deep Lee at Kings X, but that seems to have gone quiet. If cyclists (through LCC or as a group of individuals) applied for a Judicial Review into this junction review (and others), then TfL might just start to do more than simply 'go through the motions' and ignore us each time they come along and make a bad junction worse. I'd happily pledge a few pounds to this if someone set up a Kickstarter project to raise the (modest) legal cost of applying for a judicial review. The only part of these improvements i can support is the 20MPH speed limit. Everything else will not improve safety, why are the road approaches being narrowed? This has the singular result of making bicycles rolling speed blocks for motor vehicles which creates resentment from vehicles. The southern side of the roundabout still diverts cycles through the bus stands, have you ever cycled through here, it's dangerous, buses have numerous blind spots and you willingly throw bicycles into groups of 5 or more. They can't see us, it's not safe. There is a wide kerb between the bus stands and the roundabout, why not make this a mandatory cycle lane? And why not make all the advisory cycle lanes mandatory, why are they advisory, why waste the paint and money when motorists can just ignore them. This roundabout is very wide and you are wasting a huge opportunity to do something meaningful, narrowing roads and forcing bikes and vehicles together will cause accidents, advisory cycle lanes are pointless. 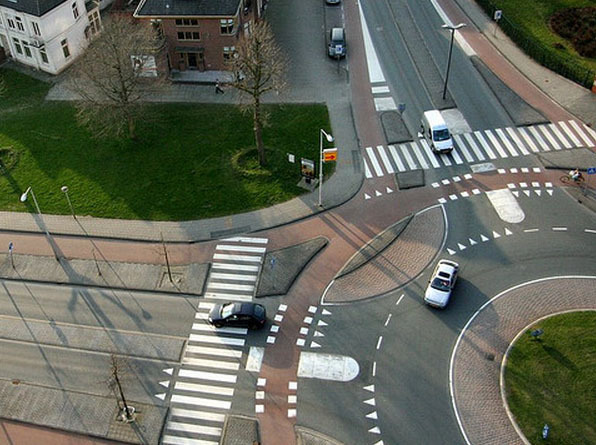 Please reconsider and look at how the dutch approach roundabout design. As someone who actively avoids this junction due to safety concerns, these changes certainly wouldn't encourage me to use it even though it would shorten my route. Done, and used your very helpful comments as the basis for my response. I encourage others to do likewise. I'm starting to wonder whether the whole 'Better Junctions Review' is just a TfL wheeze to get money for stuff they wanted to do anyway while pretending it's about making cycling safer. These designs are no better for cyclists than the stuff they were doing before, they're just doing them faster now. I can only share in the outrage at being "consulted" on proposals planned to be implemented a week later. What do they take us for? I will respond of course, but perhaps it's time for another protest ride. true looks worse than it is now - what/who is the basis of their design input? also as anote re ducth style rounabouts - they work well in urban areas of NL due to the strict liability on car drivers - it makes them very cautious / courteous at these junctions. As a Dutch cyclist and motorist I can honestly say that 'strict liability' has n't ones been on my mind in any decision I took on the road, wether on my bike, as a pedestrian or driving the family car. I feel so sorry for all cyclist in UK who doesn't get proper infrastructure..
One of the main difficulties with all the proposed changes here is that, overall, the scheme will probably work. My view is that even with the massive failings you will see a reduction is casualties and, potentially, an increase in the number of cyclists using the junction. My thinking is that the biggest thing you can do to reduce danger on most of London's roads and junctions is reduce the speed limit (and inforce the reduction). This alone will probably have a statistically significant benefit (although this would be much increased if the reduction in speed limit was extended further into the surounding feeder roads). My worry is that any safety improvements that do arise from this redesign, even if effectively caused by just the one factor, will cause the whole plan to be used in other locations (basically, the improvements caused by one change effectively being used to justify the other inneffective/dangerous changes). Picked up the reporting from July on the junction review on http://www.london-se1.co.uk/news/view/6189 this morning. 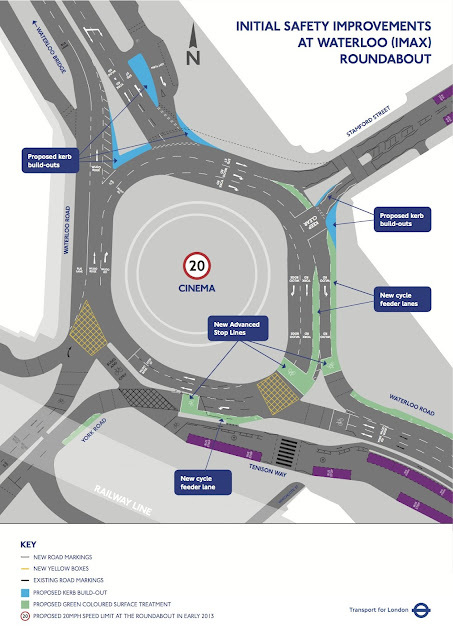 Junction review promise "will involve widening junctions to allow more space for cyclists, creating more segregated cycle lanes and installing 'early-start' traffic signals to allow cyclists to move through the junction ahead of other traffic." Reality? At Waterloo we seem to have narrower junctions, un-segregated lanes and no early starts.